Turns out it’s not a pretty picture at Instagram. The wholly owned subsidiary of Facebook (a bargain at $1 billion five years ago) is the mobile equivalent of three-ad monte, allowing sponsored posts to pass as genuine content. Problem #1: The Federal Trade Commission has busted about 90 Instagram influencers and told them to disclose that their posts are ads in Instaclothing. Problem #2: Many of Instagram’s 700 million users are being bot-licked by marketers, as the New York Times’s Sapna Maheshwari reported. 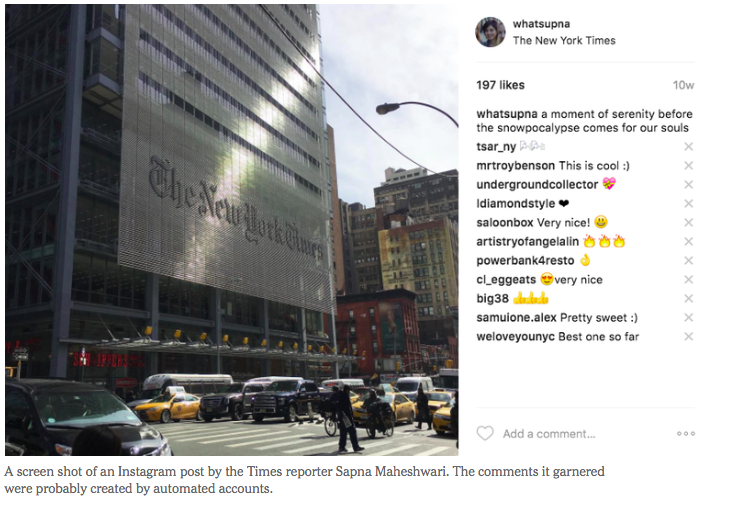 I posted a picture in March of the New York Times headquarters looking serene before a snowstorm to my Instagram account. The photo attracted 11 comments, all from strangers. “Very nice!” a monthly cocktail delivery company in San Francisco wrote. A cosmetic tattoo artist in Vancouver, British Columbia, posted three fire symbol emojis, and a vintage furniture seller in San Jose, Calif., left an emoji of a heart with a bow around it. I like to leave my apartment for cocktails, I don’t have any tattoos and I’ve never been to San Jose. So, what was up? The answer, as with so many things online, came down to marketing. Many people with public accounts on Instagram may not realize that when random users follow them or like or comment on their posts, it is often the work of a cottage industry of websites that, for as little as $10 a month, send their clients’ accounts on automated liking, following and commenting sprees. It’s a rogue marketing tactic meant to catch the attention of other Instagram users in hopes that they will follow or like the automated accounts in return. 2) Instagram has asked influencers to use a “paid partnership” tag on posts they’re paid to produce. And if they don’t? You know what they say about when you assume, right? Bottom line: Don’t assume the Instascams will end anytime soon.